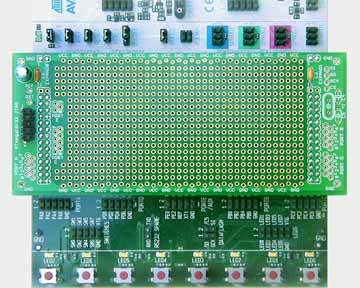 The Expansion Board provides a prototyping area of approximately seven-and-a-half square inches. All interesting signals from the STK500 expansion connectors are brought to clearly labeled pads on the left or right sides. There are plenty of connections to power and ground. If you use an ATmega16 or ATmega32 in the STK500, you can connect to their JTAG ports with the ten-pin header at the left of the Expansion Board. This will give you access to the on-chip debug features of these MCUs. You can connect with the Atmel JTAG ICE, the ECROS Technology AVR ICE-Cube or any other compatible JTAG interface. The LCD Version of the STK500 Expansion Board has all the features of the original and adds a footprint for the 2 line by 16 character LCD used in the Dragon Rider 500 optional LCD Add-on Parts Kit. To make space for the LCD, the area available for prototyping is slightly reduced, but parts can be mounted under the LCD module. The HD44780-type LCD controller is pre-wired in 4-bit mode to Port D, but provision is made for changing this if desired. The read/write control line can be connected to any port bit or, to save an I/O line and simplify software, it can be pulled down and the controller operated in write-only mode. A trimmer potentiometer allows the LCD contrast to be adjusted. The optional LCD parts kit is identical to the Dragon Rider 500 LCD Add-on Parts Kit. Click this button for technical details on both versions of the STK500 Expansion Board. 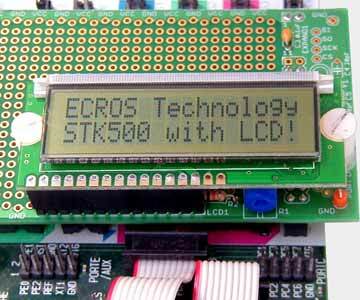 Click this button for additional technical details on the LCD version of the STK500 Expansion Board.